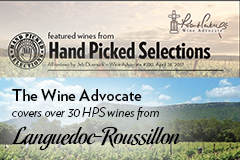 Huge Languedoc Roussillon Summary in WA! Over 30 HPS wines are covered here, including upcoming releases from Cabirau, Penya, and VTV… plus new releases from Jeff Carrel, Lancyre and l’Edre. The PDF is replete with outstanding scores and quotes, plus photos of the vineyards and producers. Be sure to check it out!